[illustrated]: ISBN 978-0826515964, $69.95; paper: ISBN 978-0826515971, $27.95. Scholarship on the civil rights era has been shaped in significant ways by white southerners from religious families who witnessed the injustices of the Jim Crow system during childhood and subsequently published books that reflected upon and interpreted their experiences. Timothy Tyson’s Blood Done Sign My Name and Charles Marsh’s The Last Days are just two examples of this compulsion to explain what now seems inexplicable. In the introduction to Living as Equals, Phyllis Palmer describes her similar background and, we might assume, comparable desire to explore the complexities of race and religion in recent history. Living as Equals is not a memoir, but it does qualify traditional narratives of the civil rights era which focus attention on the recalcitrance of whites whose resistance to racial equality marks popular memory. However, Palmer reminds her readers that most white Americans were not violent racists, nor were they avid supporters of the civil rights movement. Historians have recently begun examining the actions and attitudes of the majority of whites who located themselves between these two poles, and Palmer’s work belongs in this discussion because it explores the efforts of “white Americans who responded hopefully to the civil rights era’s promise of a freer and more equitable nation” (6). If most white Americans did not actively participate in a civil rights movement, then “civil rights inspired some white Americans to become new kinds of white people” (13). Palmer aims to trace how and why these changes occurred. Most whites did not respond as hopefully as Palmer’s subjects, but these three organizations, or “communities” as she calls them, warrant careful consideration for understanding the changing dynamics of race from the 1950s through the 1980s. Chapters 1 and 2 assess the National Conference of Christians and Jews’ (NCCJ) Brotherhood Camps. Inspired by religious imperatives of community and equality, these summer camps brought together teenagers from a variety of racial and religious backgrounds. Campers inevitably experienced a variety of “encounters,” as they shared living quarters, discussed current events, and pursued romances. Palmer emphasizes that camp leaders “had a more radically democratic ideal in mind than opening up a white world to a few nonwhites who could assimilate” (35). NCCJ counselors organized activities and discussions which facilitated interracial cooperation and dialogue in an environment where campers did not feel threatened. About twenty-five thousand young people participated in camps that were conducted in New York City, Newark, and Los Angeles between 1951 and 1974. Chapters 3 and 4 evaluate Neighbors Inc. (NI), an organization composed of residents from four neighborhoods in Washington, D.C., which sought to “preserve the area as a first-class community of good Americans regardless of race and religion,” according to its founding document (98). NI included 175 households by the end of 1958, the year it was established. Homeowners who participated focused on three objectives. First, they actively opposed the convention of labeling real estate as “colored” in advertisements listed in the Washington Post and Washington Evening Star. The newspapers quietly dropped the descriptor in 1960. Second, NI worked to maintain open communication among residents by establishing and distributing a monthly newsletter. 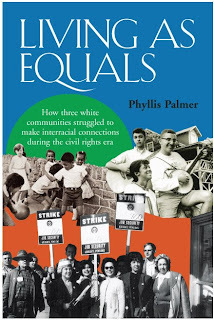 Third, NI marketed their interracialism, creating what Palmer calls “a narrative of middle-class, family oriented, multiracial achievement and security to compete with the idyll of white suburbia” (105). Readers of the SJC might be most interested in Chapters 5 and 6, in which Palmer analyzes multiracial community organizing in San Antonio, focusing upon the quest by Mexican American and African American groups for greater political power. Early efforts to address the immediate needs of racial minorities were largely confined to the city’s Roman Catholic diocese, particularly Archbishop Robert Lucey, whose appeals to Anglo charity resulted in “acquiescence to policies that offered a bit of relief and left intact the racial norm: white people controlling public life” (181). The foundation of Communities Organized for Public Service (COPS) in 1974 challenged this norm to such an extent that the 1977 city council elections resulted in victory for five Mexican Americans and one African American. These three disparate narratives are loosely held together by several themes. Many figures who sought interracial connections were motivated in part by religious faith. Another theme involves the assertions of racial pride and consciousness in the late 1960s. Such expressions provided special challenges to the NCCJ’s efforts at facilitating racial harmony among teenagers, for example, while COPS ultimately benefited from greater Chicano consciousness. Palmer also makes concerted efforts to emphasize the roles of specific individuals in these stories, an objective made possible by her extensive use of oral histories. She notes that the organizations in her study enabled white Americans to cultivate new relationships and undergo “intellectual and emotional shifts” (12). Palmer contends that these new associations and perspectives were transformative and crucial for understanding how some whites awakened to the possibilities of interracial cooperation in the civil rights era.